Vegan Mayonnaise: The Future of Food? Our diet, even today in the globalised age, is made up of surprisingly few plant species: Wheat, rice, potatoes and maize are the major carbohydrate sources for almost the entire planet. When it comes to livestock fodder, fruit and veg, the range is a bit broader but still limited to maybe a few hundred plant species and that although there are estimated to be over 400,000 plant species living on this planet! So why is that? The reason for this is historical or at least traditional. Since the beginning of agricultural farming (~12,000 years ago) plants have been selected for productivity, palatability and resistance to pests, disease and environmental stresses. The plants we eat today are a reflection of our history, culture and tradition: the exploration of America marked a turning point in world history as well as European diets since it was the Spanish conquistadores who brought the potato plant back from their travels. Today in our globalised world, exotic fruits are flown around the planet so that we can enjoy kiwi, peaches, and strawberries, all year around. Still, rice and wheat remain the main food crops in Asia and Europe respectively as they have been for millennia. A company that has picked up on that is Hampton Creek, a food company based in San Francisco. 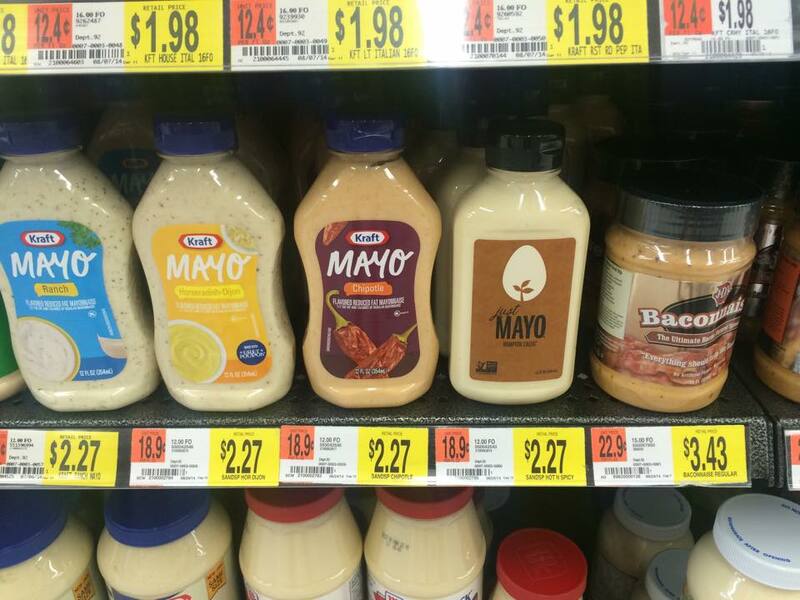 They have developed a vegan mayonnaise substitute called Just Mayo. The key in developing this product was finding a substitute for the egg (yolk) traditionally used in mayonnaise. Just Mayo instead uses “Pea Proteins” as they declare it on their ingredients list. The company has screened, according to their press releases and adverts, many thousand plants for their properties and potential to replace eggs and continue to do so. “Pea” usually refers to the seeds of the Fabaceae family but what species and variety is actually used and how the protein is being extracted from the pea remains the companies secret. Known is that the product has only 65% of the saturated fatty acids of conventional mayonnaise and is cholesterol free. “So what?” may you ask. After all organic food stores and supermarkets have been stocking plant-based alternatives for a long time, especially soy-based dairy substitutes and tofu. But the general conception is that vegan food is for hippies and leads to vitamin and protein deficiencies although it is in principle a lot more sustainable and more or just as healthy (with animal welfare being a whole other issue in our intensive meat industry). So in a way, Hampton Creek took and old idea and turned it into something more: looking at their ads and website, Just Mayo almost appears to be a superior lifestyle product with supreme nutritional value. In a funding campaign in February, the company raised 23 million USD, they were in Bill Gates’ The Future of Food feature and recruited Chris Jones (contestant of an American cooking reality show), Joshua Klein (CalTech graduate who previously worked on HIV treatment discovery), and Dan Zigmond (formerly Lead Data Scientist at Google Maps). Up to now, Just Mayo was mostly sold at up-town organic food stores, but their products are now available in Walmart (the world’s largest retailer) which will surely bring production volumes up and prices down. Hampton Creek’s success has shown that there is a growing market for vegan products. Will this be the future of food? Are we learning to use the plants around us so that our diet becomes healthier and more sustainable without actually losing variety, money or taste?